I do not envy my colleagues who have spent the day calling politicos and local bigwigs for quotes about the late Ted Kennedy. I offered a quote of my own, which I suspect won't make it in the paper: "He was nowhere near as awful as his enemies said, and nowhere near as awesome as his admirers insisted." The same can be said of this blog post. Actually, the story I linked to about “shake-and-bake” meth doesn’t say anything about banning pseudoephedrine; that’s just me extrapolating past drug-fighting trends into the future. So the eventual ban shouldn’t affect me personally, if I can just catch and work through about 110 colds before it becomes law. Coincidentally, I agree with all three statements (except I’m pretty sure it’s already illegal to step on sleeping people, and the mayor had nothing to do with that). But solving the homeless problem is just as simple and easy as the young artists’ suggestions would indicate: have government pass a law requiring everyone to buy a place to live. For anyone refusing to make such a purchase, simply charge them a tax almost as high as housing costs, to incentivize people into wanting a place to live. If it’ll work for health insurance, why not housing, too? Shrug. My mother’s parents were born in Poland, but eventually moved here and became Dumb Polacks who took factory jobs away from deserving Americans. But my grandparents came here legally, by which I mean they bought one-way tickets to America and passed a TB test when they got here. (If that’s all it took to emigrate nowadays, I’d’ve long since become “one of those dumb American immigrants taking jobs away from deserving New Zealanders. Or maybe Tasmanians.”) If they had to leap over the same hurdles as today’s immigrants, they never would’ve left their miserable little Polish farm village not far from the Russian border. So I think the best way to solve the illegal immigrant problem is to reform immigration law and processes so more people can come in legally. However, even if I were the type of person who sincerely believed, for some reason or other, that immigration was bad for America and needed to be stopped, I hope I’d never be callous enough to deny water to a would-be immigrant dying of thirst in the desert. Walt Staton, a member of the group No More Deaths, left full water bottles in December in Buenos Aires National Wildlife Refuge for the illegal immigrants who routinely pass through the 18,000-acre refuge, according to court documents. A judge sentenced him Tuesday to 300 hours of picking up trash on public property and a year of probation, No More Deaths said in a written statement. He is also banned from the refuge during that time, the group said. Although the case involved only a misdemeanor charge, both sides used the divisive issue of illegal immigration in their arguments; Staton's lawyer argued that Staton's actions were humanitarian, but the government said otherwise. Mike Hawkes of the Buenos Aires National Wildlife Refuge said Thursday that although he had no issue with groups leaving water out for illegal immigrants, "there's ways to do it without leaving plastic jugs out there." …. Hawkes said refuge officials and members of No More Deaths had met and were trying to come up with methods that don't involve plastic bottles. In a sentencing memo, the federal prosecutors wrote that Staton's "actions are not about humanitarian efforts, but about protesting the immigration policies of the United States, and aiding those that enter illegally into the United States." Noting the phrase scrawled on many of the plastic water jugs -- "buena suerte," or "good luck" in Spanish -- the prosecutors said, "The obvious conclusion is that the defendant and No More Deaths wish to aid illegal aliens in their entry attempt." True. It’s also true that in this case, “aid illegal aliens” is exactly synonymous with “save people from dying of thirst in the desert.” Whatever damage illegal immigrants might do to my country isn't as bad as what the prosecutors do to my country by making a federal case out of that. I spent the second half of my Canadian vacation in Montreal, so my Traveling Companion could attend Anticipation, the 67th annual world sci-fi convention. One discussion panel, which had a title like “Legal Systems Past, Present and Future,” had as a panelist a Scottish writer named Charles Stross who, at one point, while discussing some particularly nasty laws of days gone by, said “If you think the U.S. has draconian laws now …” My now-required-to-return-home passport weighed heavy in my purse when I heard this; damn Ronald Reagan, I thought, whose ramping up of the war on drugs led to a country formerly known as a bastion of freedom being known instead for things like “draconian laws.” Damn the second George Bush, whose cowardly response to the 9/11 attacks turned this up to 11. And damn Barack Obama for reneging on his promises to reverse this trend. 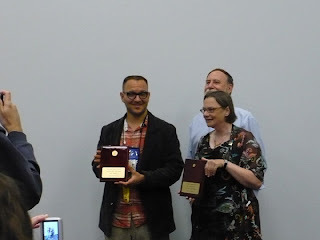 These patriotic platitudes remained in my head a day or so later, when I watched Cory Doctorow receive his Prometheus Award for best freedom-themed fiction (for his novel Little Brother). It’s a fine book to be sure, but has no goddamned business being considered “relevant” in a country that labels itself “free.” Of course, that’s the country’s fault, not the author’s. Do you guys have any suggestions? I’m clean out of ideas. Never trust a French-Canadian hotelier who says “We have high-speed Internet. 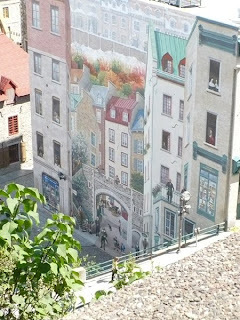 I learned this last week in Quebec City and later in downtown Montreal. But after walking dozens of miles through Quebec’s quaint, charming and extremely steep and hilly architecture, quaint 1990-era bandwidth speeds almost seemed right. 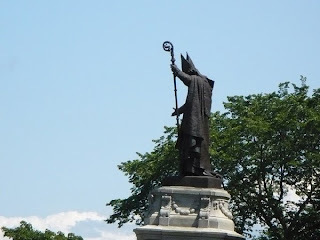 After returning to the States and my own wonderfully well-Internetted home last night, I emptied the souvenirs from my luggage and photos from my camera’s memory card, including some from Quebec City. But no. 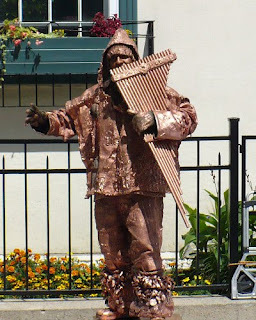 He was a street performer who’d covered himself in copper gilding before playing the pan flute on one street corner. He didn’t acknowledge me or any of the other people who dropped Canadian one- and two-dollar coins in the begging can he had before him. Detail of me just below the guitar player. I’d originally planned to strike a pose to blend holistically with the greater mural, but a high hillside wind scotched that plan when it started blowing my hair into my face. 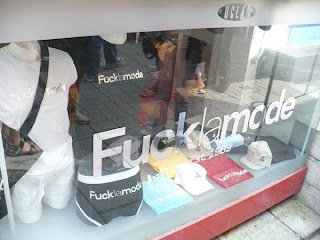 Every English speaker took at least one picture of that window. It is the law. 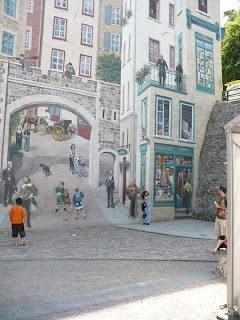 My Traveling Companion and I spent the day tramping through the oldest parts of Quebec City, which meant we spent lots of time climbing up and down sharp hills and steep staircases. Five solid hours of this left us pretty worn out, so when we returned to our hotel this afternoon we decided that instead of going out again, we would simply have dinner at the large, fancy-looking Chinese restaurant next door. 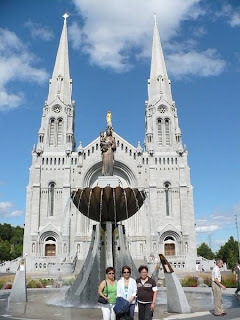 Every single person we’d met in Quebec thus far spoke English better than the average American high-school student, so I decided to take the French phrasebook out of my overstuffed purse and leave it back at the hotel. Naturally, this resulted in the Chinese restaurant’s having the only wait staff in all of French Canada where everyone speaks English as badly as I speak French. The menu didn’t have English translations either, but the restaurant had a buffet option and I didn’t need a phrasebook to know the French word for buffet (“buffet”), so we were able to order without too much difficulty. The buffet had an entire small table that held various types of bread and rolls, and a miniature version of the conveyor-belt ovens you sometimes see in pizza restaurants – put your bread on one end of the conveyor belt, and by the time it emerges out the other end of the oven it’s nicely toasted. I put a dinner roll on the conveyor belt and went to get some butter (“beurre”). When I returned, I expected to see my toasted roll waiting for me in the oven’s catch basin. What I saw instead was an empty catch basin and a few thin wisps of smoke wafting out of the oven. Uh-oh. The dinner roll was maybe one-sixteenth of an inch too thick to make it through the oven; the conveyor belt carried it to the halfway point, where it got stuck. I couldn’t possibly reach it myself, so I went looking for a waitress to help me. I couldn’t find one (side note: I’ve eaten in four Quebec City restaurants since last night, and by American standards every one of them has been hopelessly understaffed), but I did eventually find a teenage busgirl adding croutons to the salad bar. She repeated the only word she’d understood – “Bread?” – and turned to get more from the kitchen. “Non, non,” I said, and gestured toward the oven on the bread table. “My bread – ma pain – is burning – uh, c’est fumée, – no, dammit, that means it’s smoking – c’est stuck in the oven …” Finally, I trailed off and gestured for her to follow me to the bread table. Considering the bad reputation Americans already have in foreign countries, I really, really hope they thought I was from Toronto. Eat your vegetables. Brush your teeth. Take your vitamins. Don’t slouch like that. Make sure your jacket’s zipped all the way up to your chin. I DON’T CARE IF IT’S AUGUST, GODDAMMIT, ZIP UP YOUR JACKET AND DON’T TALK BACK TO ME AGAIN! Sorry. Sorry. Didn’t mean to yell like that. It’s just that I’m a little tired right now, having driven all the way from Connecticut to the luxurious Super 8 on the outskirts of Quebec City. (By “luxurious” I mean “It has an indoor water park.”) I also made the mistake of stopping at the Vermont “Welcome Center” on I-91, just over the state line from Massachusetts. Vermont’s a lovely state, but I always experience a wave of low-grade irritation when I stop at the Welcome Center and read all the signs reminding my grown-up self that seatbelts are good and smoking is bad and making personal decisions is hard and that’s why the government does it for you. The Welcome Center sign that irritates me most of all is actually two signs mounted on a single post by the center’s exit ramp; the top sign says “Airbags Save Lives” while the bottom one reads “Place Children in Rear Seat.” I always thought truth-in-advertising laws should require an additional sign explaining that kids have to stay in the back seat because if they’re up front, an exploding airbag will kill them. But I had no time for filing lawsuits today, because I wanted to cross the border into Canada as soon as possible. I did, however, have my camera ready, so I could photograph the sign and then Photoshop it into something educational enough to post here. But when we got to the exit ramp, the sign was gone. He, of course, had no interest in seeing them; he just wanted to make sure we wouldn’t wind up stranded in his country now that our own freedom-loving government won’t let us come home without a passport anymore. I think my shoulders slumped a little when I said “Yes, thank you,” to the guard. The line of American cars trying to get into Canada was much, much longer than the line of Canadian cars trying to enter America. Considering how insulting my government is to its own citizens these days, I don’t blame so-called foreigners for wanting to stay the hell away. I would too, if I had anywhere else to go. Life rarely gives you the chance to take back missed opportunities but this time might be an exception, since I leave for Quebec City tomorrow. And not a minute too soon! Between my regular job, some freelance assignments and the time I spent hunting down my passport after the post office lost it, I’ve been working 70- or 80-hour weeks lately, so my hope is that of I recharge my batteries now, I can maybe get back to updating this-here blog more than thrice in a blue moon.